Located in Brno, Orea Resort Santon is on a lake, a 1-minute drive from Brno Reservoir and 9 minutes from Moravian Museum. This spa hotel is 5 mi (8 km) from University of Technology Brno and 5.3 mi (8.6 km) from Brno Trade and Fair Centre. Situated on the outskirts of the city, Campea Aparthotel offers accommodation in comfortable double rooms with the modern equipment and views of the city. Free WiFi is available in all areas and free private parking is possible on site. All studios are equipped with a kitchenette, cable TV, and a bathroom with shower and toilet. The on-site restaurant serves Czech and international cuisine. Several shops, grocery stores and restaurants are within a range of 400 metres. Guests of Aparthotel Campea can request massages, laundry service or use the hotel’s business facilities. An elevator and free private parking are further amenities of the property. The property is 2.1 km from BVV Exhibition Centre and 4.6 km from Villa Tugendhat. An aquapark is 5 km away. The bus stop Univerzitní Kampus is just 100 metres away. Located on a quiet street in Brno, Hotel Omega Brno offers rooms with free Wi-Fi and cable TV, just 0.5 km from the Brno Exhibition Grounds. Facilities include a squash court. The rooms of Omega Brno Hotel feature floor-to-ceiling windows, making the rooms light and airy. All rooms feature a work desk, a hairdryer, and a private bathroom. The restaurant serves local and international cuisine. Guests can enjoy a relaxing drink at the wine room and beer hall. Hotel Omega Brno’s staff is available 24/7. The hotel also offers fax and photocopying services. The Cathedral of St. Peter and Paul is 1.2 km from Hotel Omega Brno, and the Old Town Hall is 2 km away. In a quiet area of Brno, 3 km from the centre, Hotel Albellus is within 200 metres of Stará Osada Bus and Tram Station. It offers free WiFi, free camera-secured parking, and a 24-hour reception. All the stylishly decorated rooms come with luxury mattresses, an LCD TV, and an en-suite bathroom. Most units have a balcony as well. Wheelchair-accessible rooms are available. Breakfast is served daily at the Albellus Hotel, and restaurants can be found in the immediate vicinity. A tennis court, which can be used throughout the year, is featured on site. Kuldova Tram and Bus Stop, Gajdošova Bus Stop, and Mošnova Bus Stop are within 600 metres. 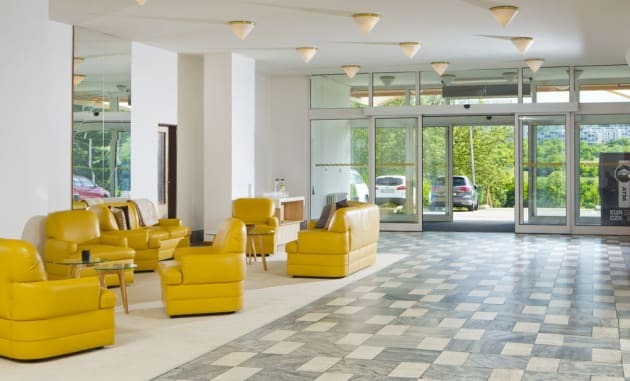 The Albellus Hotel has easy connections to the Brno Tuřany Airport, the BVV Trade Fairs Brno Exhibiton Centre and the Brno Grand-Prix Circuit. The motorway to Prague, Vienna and Bratislava is easily reachable.